The Park, a new indoor-outdoor space featuring restaurants, bars and a variety of entertainment options, debuted earlier this month on the Las Vegas Strip. Situated between the New York New York Hotel & Casino and the Monte Carlo Resort and Casino, The Park also houses the new T-Mobile Arena, a 20,000-seat concert and sports venue. The new dining and drinks destination includes national chains Shake Shack and California Pizza Kitchen, as well as single-unit concepts Beerhaus, Sake Rok and Bruxie. Beerhaus is a modern American beer garden that offers craft brews and beer-friendly fare like sandwiches and sausages. Inspired by Tokyo pop culture, Sake Rok serves Japanese cuisine complemented by sake, specialty cocktails and punch bowls. Beerhaus highlights games like foosball, shuffleboard and pingpong, while Sake Rok turns into a late-night dance and performance space. The fast-casual eatery Bruxie serves all-day brunch with a focus on gourmet waffles. All the venues have indoor and outdoor seating. The Park, owned and operated by MGM Resorts International, aims to be an outdoor oasis on The Strip. Beyond its restaurants, the space incorporates patio areas and seating alcoves tucked behind desert landscaping features. Its design features marble surfaces and mosaic tiles that reflect the American Southwest. 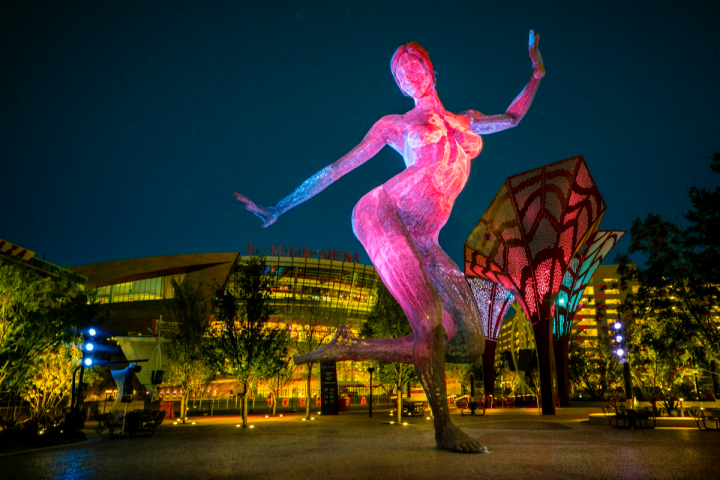 Decorative elements also include a water wall that stretches more than 100 feet in length, as well as a 40-foot-tall sculpture of a dancing woman and nearly 3,000 colored LED lights that switch on at night.